Fully optimized for iPad Pro and Apple Pencil! 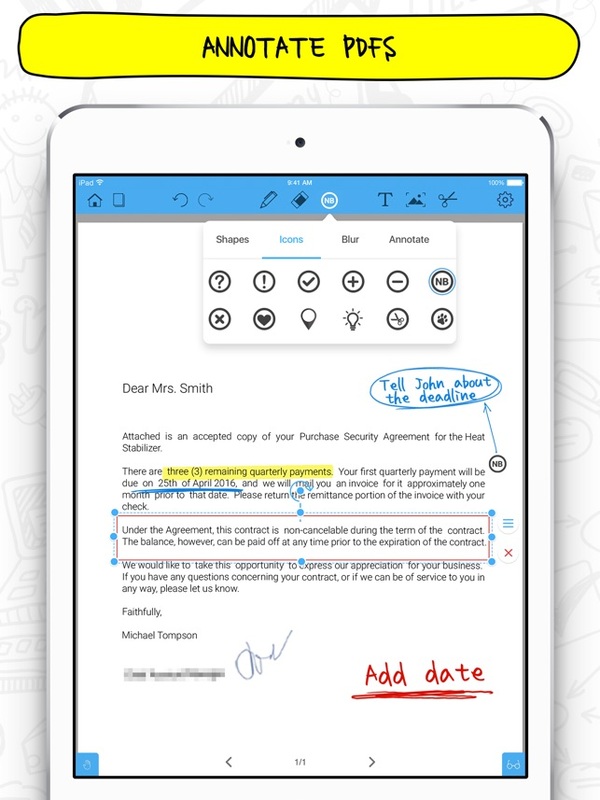 Notepad+ is pen and paper right on your iPad exactly when you need them. 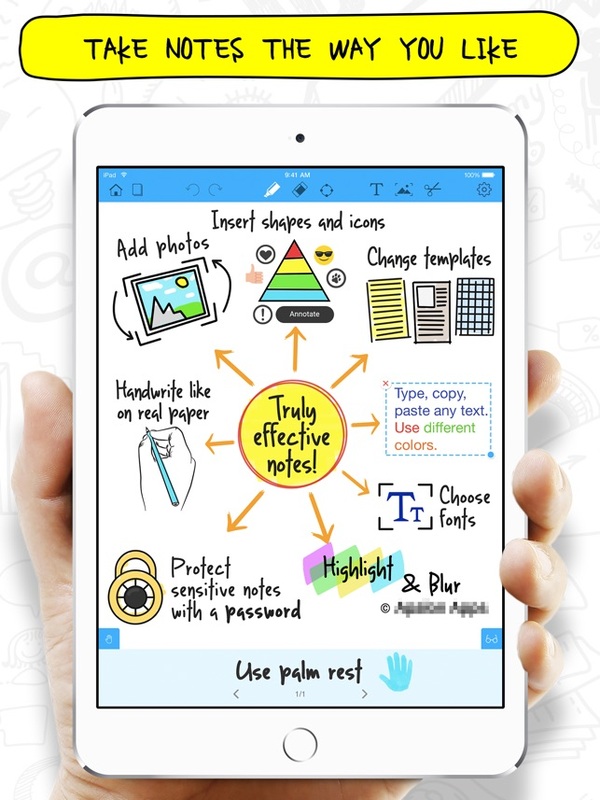 Take notes, draw, make sketches, annotate PDFs, create lists and memos, export your notes, and discover other great features. From now on you can be more productive than ever! - Photo extension: mark up images right in your iPad's Photos app, use pens and highlighters to add notes and captions easily. 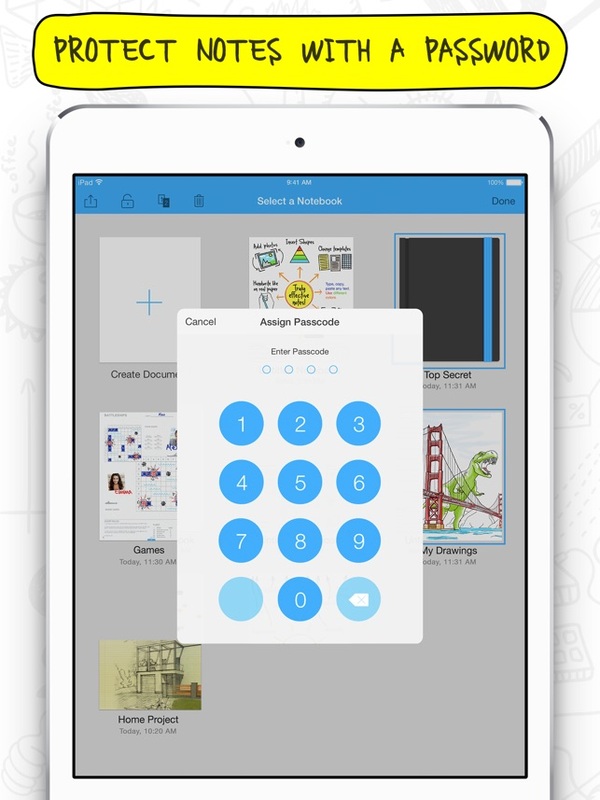 Notepad+ gives you the best of a digital notebook, all in one place. *Photos – so you can import your snapshots, mark them up, and save them. 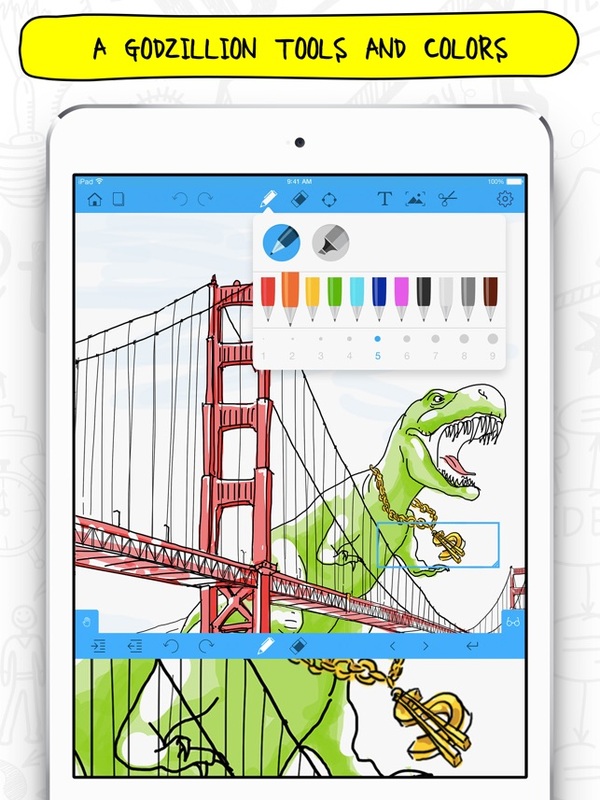 *Camera – so you can take photos and edit them within the app. *Contacts – so you can add them to documents and email your notes. * Performance and stability improvements for flawless work on iOS 11. This is still a go to app for me. Two requests: please add a button to select a highlighter pen directly without going through the main pen menu. Also, being able to categorize pages would be handy. But of the two, having separate menus for the pen and highlighter is the higher priority for me. I love this app. It’s ability who’s the one the reasons why I bought an iPad Pro. My two top request for the app are that multitasking be enabled so that I can use this app while using other apps on the iPad Pro. And secondly, I would like to be able to export all of the pages and I document as one unit rather than a separate pages. Other than that I love the ability to write with multiple pen colors and sizes and Multiple highlighter colors and sizes. Ok, I’m still wishing and wishing for multi-tasking. This app is killer. But I have to use it exclusively when it would be so helpful to have it as a “reference app” while using another app. There is always room for improvement and we appreciate your kind contribution. If you have more to say, please write to us at support@apalon.com. Thank you for using our app. I absolutely love the way the app works. I would use it to replace several other apps - including the almighty Evernote - except for ONE problem. The developers have decided not to include the ability to categorize notes into folders. That makes organizing my work completely impossible. Therefore, I rarely ever use it. I use Evernote 3-4 times a week. That’s a LOT of notes. If I couldn’t categorize them, I wouldn’t be able to go back and find them. Until Notepad + Pro incorporates that ability, I will almost never uses it - otherwise I’d have to search through an interminable list of randomly organized notes to find the one I want. Add categorization, and this is an Evernote slayer. 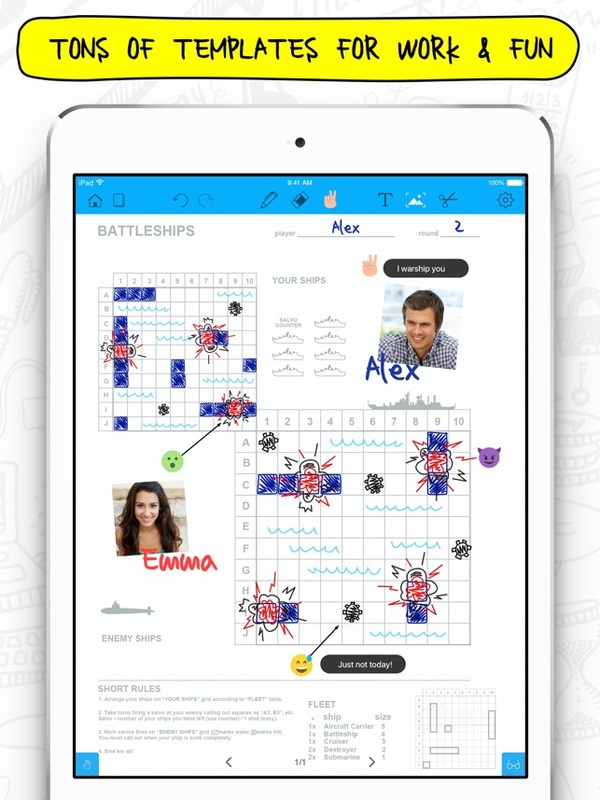 Without it, it’s just a doodling tool. So for that reason, it rates only two stars. Fix that problem, and it get’s six stars and knocks Evernote off the top of the heap. Thank you for your feedback. We appreciate your comment and will consider it while working on future versions of the app. If you have any further suggestions or ideas - please let us know at support@apalon.com. Thank you in advance! This app really useful. I really enjoy and lecture all of my notes with this app but this app have 2 things that I wanted developers to improve. First is “drawing straight line tool” becoz even i use ruler(yes real ruler)and try to draw straight line. I cant even make a straight line. I think straight line tool is really important for drawing something (You have a line tool in shape tools but its too slow to draw many line with that tool. I wish you can make drawing line tool like notes writer app). Thank you very much for your feedback and ideas! We're always aiming to improve our app therefore your comment is really appreciated and will be considered in the future updates. Thanks for using our app!